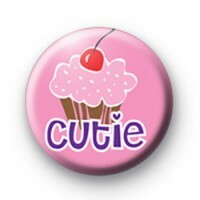 This is a listing for a pink 1-inch button badge with a pretty pink Cupcake with a cherry on top. It's a girly badge and would be lovely for people that like to bake or that just love cupcakes. I mean, who doesn't love to eat cupcakes, right! We have quite a few baking and cake themed badges in the shop, ideal for anyone with a sweet tooth. So make sure you check them out.